Remember that Life Cereal commercial? Sure you do if you are 'of a certain age'! Well, today I'm Mikey. This is the first time I've gotten to be Mikey with Puerhs. Granted this is only my sixth try but I think I like it! Hey Mikey! My head hurts a little and my stomach says 'Stop for awhile, maybe, huh?' so after six initial steeps, not counting a bath and two rinses, I am taking a break. As you can see from this photo of just the third steep the color is amazing. I decided to go ahead and make it in my Yixing pot which is new, and not truly seasoned. 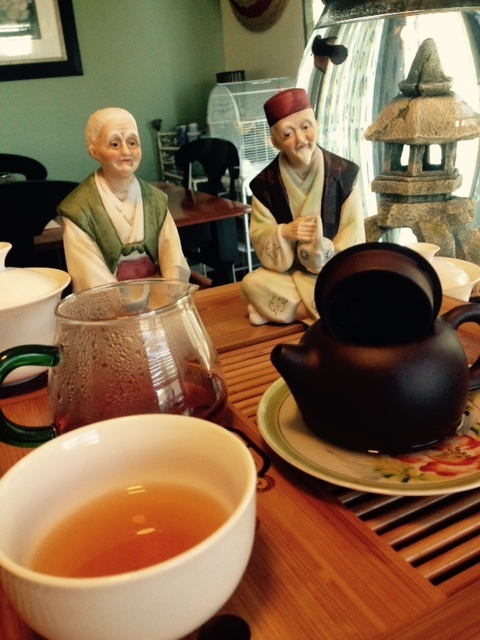 I felt that if the flavor were too strong the Yixing might help by stealing a bit of the flavor for me. Don't think that was needed, or happened, and I did NOT use the Yixing Cha Hai but it went right into a glass pitcher so I could see the color. Total flash brews, or maybe five seconds at most. I don't want to over-brew this, especially since I am actually having a good exploration for the first time. Also notice the tea company, Hidden Peak Tea-house says they sent 10 grams, but this weighed in at over 12! Nice. Not only do they have the prettiest website I've ever seen but they have a heavy hand with the scale too? Fabulous stuff! My session with Trinity continued after supper. It became weaker and lost flavor but by that time I had lost count of steeps. I am guessing no more than a dozen though. I am still so new to Puerhs in general that I don't know if I gave up on it too soon or not. Certainly I should have at least added more leaves to boost the flavor. That being said, I loved how the flavor progressed as the brews weakened. Initially the smell is very earthy, garden soil, peat moss, then I smelled rain on hot sidewalk. Then suddenly one brew became peppery and then the next brew got sweet! Then I got a little sweaty and realized I had better stop. 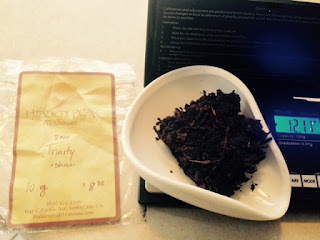 Here is a photo from Hidden Peak Tea-House of Trinity that you must see. Whoever the photographer and designer is should take a bow. It was the photos that inspired me to buy eight Puerhs from this site at the same time! I literally based all my decisions on the the photos. I didn't even worry about cost on these purchases. 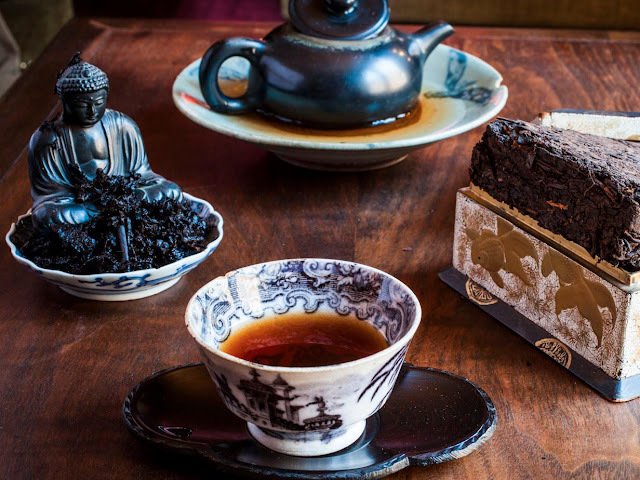 Thankfully this wonderful teahouse, whom I hope to visit one day offers small portions so newbies such as myself have a shot at trying our hands with real quality tea!